Sadly my mother passed away a few years ago. When she passed she was at a hospice. The last 2.5 months of her life were spent in hospital, in rehab, at a managed care facility and finally at the hospice facility. There were several uncanny events surrounding her passing. Firstly, although she was not in her right mind for several months before she departed and she had not been conscious for several days before death, she managed to die within 48 hours of the first anniversary of my father’s death. Since she had been living in these various facilities for over two months she had not been at home during that time. She had both an indoor and an outdoor cat. At the time of this writing, the indoor cat continues to live. While my mother was away from home, I fed and took care of these cats along with a neighbor. 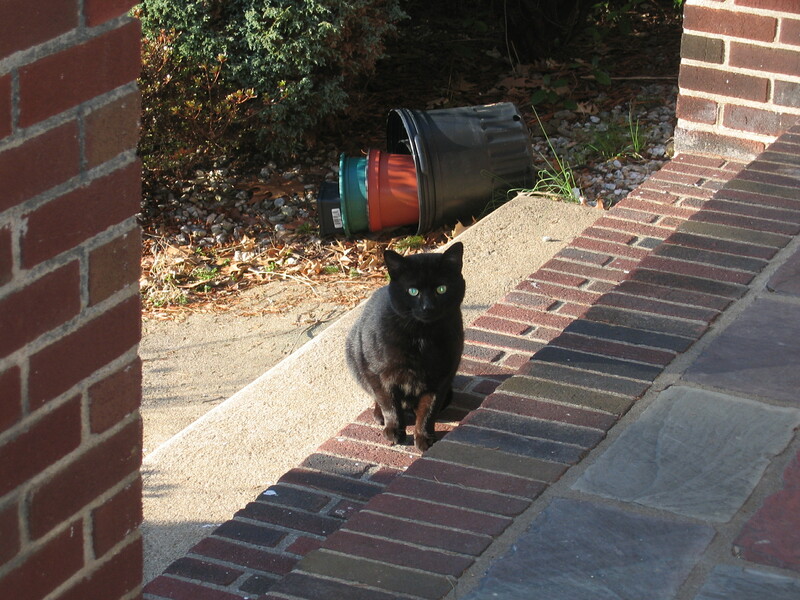 From the day my mother died, the outdoor cat, a black spayed female, was never seen again by anyone in the neighborhood, though previously she was there everyday to be fed and generally hung around. On the same day my mother’s television ceased to work, though it had operated just fine the day before. I am aware that such phenomena abound and when I read the following article sent to me by the ever resourceful Superior Bill, I knew I had to share it with you, dear reader. The article mentions two books one of which I’ve read and recommend highly: Dogs That Know When Their Owners Are Coming Home by Rupert Sheldrake. The other book is new and from Great Britain as well: The Art Of Dying by Peter and Elizabeth Fenwick. I hope to read it soon. Seems to me that the British, as a group, value their companion animals very highly and are aware of their special psychic gifts and extraordinary abilities. I wouldn’t want to get too close to anyone who is unkind to his or her companion animal. Oh, yes, one final note, apparently “mog” is a British word for house cat (please correct me if I’m wrong). Cats who know exactly when they are going to be taken to the vets. Dogs who sense their owners’ whereabouts – even if they are miles away. And birds who seem to mourn the deaths of those around them… our pets and other animals have always been intuitive – but do they really have a mysterious sixth sense? A new book by Britain’s leading clinical authority on near-death experiences, Dr Peter Fenwick, and his wife Elizabeth, a counsellor, examines the remarkable cases of psychic animals. . . There is nothing new about the idea that animals can acquire information from an extra sense that we humans have now lost – if we ever had it at all. Most pet owners can probably quote some example of a cat or dog behaving like a mind-reader. Dogs often behave as if they know when their owner is setting off for home, though the owner may be many miles away, and may wait by the door for them to arrive. Cats are notorious for being able to sense when a visit to the vet is in the offing. One academic, Rupert Sheldrake, author of Dogs That Know When Their Owners Are Coming Home, contacted 65 veterinary offices in London and asked if they had any problem with cat owners keeping their appointments. Similarly, an awareness of death is certainly not restricted to us humans. The enormous interest generated by the case of the intuitive American cat, Oscar, indicates the fascination prescient pet behaviour holds. Oscar lives in a nursing home and has an uncanny ability to sense when a resident is about to die. When a patient is near death, Oscar nearly always appears and hops on the bed. The staff have come to recognise and respect Oscar’s instincts, and send for the relatives of any patient he has chosen to curl up beside. But they have no explanation for it. Oscar shows no interest in patients who are simply in poor shape, or who still have a few days to live. One theory says a cat’s acute sensitivity to smell might enable it to detect some subtle change in metabolism around the time of death, but no one has been able to explain why any moggy should show an interest in the approach of the Grim Reaper. Given this, it is perhaps not surprising so many people have told us of deathbed-related cat and dog incidents. Ann Liddell described the odd behaviour of her Newfoundland dog on the night her mother died. Michael Finch’s mother was dying of cancer. One night Michael left the hospital and returned home to let the dog out. ‘I will never forget this as long as I live. At 10.45pm, the dog began to howl like a wolf. It was spine-chilling. I just knew this was because Mum had died. For five minutes he howled uncontrollably and then took to bed. Susan Burman told how when her husband was on his deathbed, their cat curled up by his feet. As he took his dying breath, the fur on the cat’s back stuck out as if by static electricity. We were told by a carer of a very similar reaction by a resident’s cat which normally slept on his bed. The cat happened to come into the room at the moment the resident died, and a nurse who was present reported: ‘It shrieked and sped around the room a couple of times – and then shot out of the room as though it didn’t want to be there. An even stranger story is that of the Cox’s cat. It concerns one of our oldest friends, Brian, a biochemist working in a university research department – a person, you might think, not given to imagining things, or jumping to conclusions. For some years before she died, Brian’s elderly aunt would visit regularly. Each time she came she would spend most of her time sitting in one particular chair, and the cat (gratified, as cats usually are, to find a member of the household willing to sit still in one particular place for some considerable time) would spend most of its time sitting on her knee. The aunt always insisted that when she died, Brian should ensure that she was buried beside her husband – otherwise, she said, she would haunt her nephew. Some months later, she died. Between the day she died and the day of her funeral, the cat behaved strangely. On going into the sitting room, its hackles rose and its fur stood on end. It avoided the aunt’s chair and hid behind the sofa. After the funeral, when the aunt had indeed been buried beside her husband, the cat’s behaviour returned to normal. Far from reacting like Oscar the cat – who never lost his composure in the face of death (and indeed seemed to seek death out) – most of the animals we have been told about seem to have been very disturbed. Dogs bark or howl, and cats’ fur stands on end. Perhaps they are experiencing the presence of the dying, or have an awareness of death – but there is no question of them finding it comforting. Birds, however, are traditionally associated with death – usually as harbingers of doom – and several accounts sent to us concerned bird sightings. In two cases shortly after the death, a small bird would fly into the house and perch, apparently unconcerned, on a piece of furniture before flying out again. Not all that unusual, admittedly – but for the bird to appear unperturbed is certainly strange. It’s more usual for a bird that has flown into a house to fly around, beating itself against the windows in a panic to escape. Everyone involved in each of these cases felt the bird’s visit was intimately related to the death. Alison Hole, a nurse, wrote to us describing the moments after the death of one of her patients. The heaviness in the atmosphere of a room after a death, and the feeling that ‘something’ lingers on after a death and must be released, has also been mentioned by several other correspondents. Alison reported: ‘Walking across the room was slow as the atmosphere was heavy and the floor was like walking through tar. Once I opened the window, the atmosphere in the room cleared and I noticed a white bird the other side of the window. The following story describes bird behaviour that is way beyond what one would expect of a normal bird in normal circumstances. Oliver Robinson’s owl made its appearance some time after the death it was associated with, so it falls into the category of after-death communication rather than deathbed coincidence. But the extraordinary behaviour of the owl, together with the feelings it engendered in Oliver’s mother, made the temptation to include it here irresistible. The first appearance of the owl was on one warm April morning, some months after the death of Oliver’s grandmother. Oliver’s mother here describes what happened. ‘There was a terrific commotion outside the kitchen, caused by our garden birds. When I went out to see what all the fuss was about, the birds were dive-bombing an owl which sat on one of the lower branches of the oak tree. ‘It seemed strange that an owl was out in the middle of the day, and although the small birds were trying to frighten it away, it just sat quietly in the tree. ‘As the day warmed up I opened the French windows on the south side of the house. When I stepped out into the garden, there was a great flapping of wings and the owl flew down and landed in front of me on the grass. ‘It was a large tawny owl about 12in high. It looked up at me with big brown eyes and mewed. It seemed very tame. The feathered visitor’s strange behaviour didn’t end there. Oliver’s mother continues: ‘When my husband and children came home I told them about the owl but thought no more about it. ‘We always sleep with our top windows open, and that night there was a lot of scuffling and rustling at the window. The owl came down to sit on the window – behaviour my husband didn’t like at all. ‘The next morning, I opened the kitchen windows. No sooner had I opened the large window over the sink, than there was a great flurry of wings and the owl flew right into the kitchen. ‘It seemed best for the children and my husband to go out and close the doors while I opened the outside door, hoping to coax it outside, but it seemed to be quite at home in the kitchen. ‘It flew down to the other end, and sat on the curtain rail watching me. It had a tremendous wing-span and it was remarkable that nothing was knocked over. Eventually it flew out of the window and sat on the back porch. ‘When we went out to the car later that morning, it came straight down and perched on the flowerpot I was carrying. As we drove out, it sat on the gatepost watching us. The ability to fly has always been regarded as a magical power, the stuff of dreams. Perhaps that is why birds have always been regarded as having an element of the supernatural and why, in so many myths and legends, they provide a link between the human world and the supernatural or divine, associated with both birth and death. In some cultures, the human soul is believed to arrive on Earth in bird form, and in many societies, birds are seen as carriers or symbols of the human soul, flying heavenwards after death, or as guardians who guide the soul to the afterlife. Perhaps these perplexing modern bird stories indicate the possible origin of these myths – or maybe they are a demonstration that these are more than simply legends. The Art Of Dying by Peter and Elizabeth Fenwick, published by Continuum Books, is out now. I’ve just finished reading this intriguing book of historical fiction by Noëlle Sickels called The Medium. I highly recommend it for a variety of reasons. Firstly, and most importantly, it is a good read and an easy read. It is the very human story of a young German-American girl, Helen Schneider, living with her family in Bergen County, New Jersey during the prelude to World War II and throughout the war to its conclusion. There are home vignettes and love stories embedded within the novel that are poignant. But more than that it is the story of the experience of mediumship within a family. The girl’s grandmother is a medium by trade and holds seances in the neighborhood to augment the family’s income. Helen begins having premonitions and when she attends a seance at her grandmother’s urging she discovers her ability to converse with spirits while in a trance state. This realization both intrigues and frightens Helen who must come to terms with her burgeoning psychic and mediumistic abilities. The story is very believable in most aspects, especially in the geographic references and the rich cultural milieu of the German-American family. Some readers may balk at the concept of emanations, that is physical manifestations emerging from the body during a trance. There is a nineteenth century quality about emanations. But the reference to remote viewing near the end of the book is an anachronism which is more disturbing since it comes thirty years too early. I have no doubt that the military intelligence of the day would be interested in the correct perceptions of a gifted psychic, but to refer to the remote viewing program, a phrase that was not coined until the 1970’s, tarnishes the very careful research done on many aspects of the American scene presented here. I felt very educated by the book concerning detention centers for German and Italian Americans that I was unaware had existed. The training for blind soldiers returning from the war was detailed and well woven into the thread of the story.